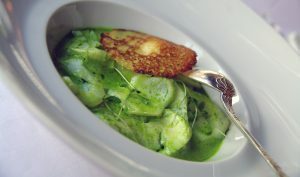 Le Doyen…Michelin three stars lunch today……23 April, Paris, France. In 1981, Ann Oliver moved from a drawing board and a career as a successful graphic artist specialising in the sciences and electronics to the kitchen. She opened Mistress Augustine’s in July 81. Described as insanity by her friends, and later by herself, she miraculously thrived. Unlicensed and never intended to be a restaurant as such, the concept of lunch and posh take home was at least 20 years premature, and, although always packed it was a financial failure. It was clear that something had to change. Oliver had the luck to have Australia’s most revered chef of the 80’s Philip Searle working next door at Possums where he was chef owner, partnered with the equally famous Barry Ross who managed front of house. Oliver admits, that had it not been for this serendipitous location and the generosity of Searle and Ross, she would never have become obsessed to the same level with food and wine, or have the cooking skills and knowledge that she has today. The transition from simple café to restaurant and to acclaim was rapid…much, to the great and generous encouragement of the local restaurant industry and in 1989, a self-taught cook, she was awarded the Adelaide Advertiser’s ‘chef of the year’. The recognition continued both in Australia and overseas and her restaurant enjoyed a period of great acclaim until she closed it in 1992. Oliver’s resume is a long list of culinary achievements including doing estage in 3 Michelin starred restaurants, working twice with the legendary late Chef Paul Prudhomme at K-Paul’s Louisiana Kitchen…all some 30 years ago. In her long culinary career that now spans almost 40 years, Oliver has developed a highly-respected reputation for matching wine and food. Her love of Champagne has seen a long collaboration with the celebrated Champagne expert Kaaren Palmer, and now, Oliver would have cooked more menus for Champagne than any other chef in Australia. In 1983, her first Champagne menu, was for Jean-Claude Rouzard, the owner of Roederer Champagne and it was the same Jean-Claude Rouzard that recommended her to Chef Gerard Boyer, then the acclaimed three starred head of Les Crayeres, Reims, France. Oliver has also worked extensively overseas in particular, China mainland in Shanghai and Chengdu. Oliver’s wine knowledge and reputation for matching food to wine is not limited to Champagne. She has worked for many wine companies including Rockford Wines and recently concluded a 10-year relationship with Penfolds at their exclusive Kalimna Homestead in the Barossa Valley. Food editor and publisher of Galaxy Guides for 10 years, her new focus is on cuisine-extreme where she is also food editor and publisher. Oliver is committed to excellence…growing up in a family that fished and hunted and grew most of what they ate, her cooking mantra has always been local and seasonal. Oliver’s 10 years of writing a weekly column for the Adelaide Advertiser and contributing to many more publications, in combination with her art and photography [all whilst running restaurants and opening international hotels and other food businesses], means that she is now uniquely placed to do many interesting projects. She is highly regarded for recipe writing and delivering recipes that work.